BROCK BAJ'ER: "Garage Sale Guidelines" for YOUR successful sale! "Garage Sale Guidelines" for YOUR successful sale! I just came from the classic American past-time: Garage Sales and Yard Sales. I’m exhausted, hot and tired and did not buy as much as I would have if people had followed a few guidelines for these things! It’s a wonder anyone sells anything at all at garage sales! I would have spent more and bought more if it had been done right. So here is my input from a pro: GARAGE SALE GUIDELINES. See? I would have been shopping at YOUR sale if you’d had these signs on neon green paper with black arrows… remember to have a sign at your doorstep; if activity slows no one will see your sale. This is especially true if your goods are in heaps on the ground. Yuck. That is so unappealing. Put your best biggest goods at the street entrance. Use them to keep people from parking in front of your sale and blocking the view of other drivers and to get attention. Put things on shelves and tables at the back of your sale so it looks like you have more and it’s visible from the street. Upright items get attention. Put wood on cement blocks with a tablecloth if you don’t have tables. Price as many things as you can, that starts the conversation and for heavens sake: negotiate! Do not use masking tape for prices, it ruins the goods. Buy price tags at Office Depot; stick them on with scotch tape. Fill in the empty spaces when things sell. If it looks like its been picked through, buyers will leave your sale for a better one with fuller tables. Invite friends and neighbors to sell goods that day too. It gets them on your side during the disruption of a sale and offers buyers more choices. More is better. Buyers stay longer, look harder, go through your sale a second and third time, when there is more to see. Be able to make change. Have $50 in $5s and $1s in a fanny pack. Use a calculator shamelessly; it will protect the buyer AND the seller from math errors. Provide bags and boxes, newspaper and help to the car. Offer to deliver large items at the end of the day for gas money. (Deliver to their curb only for insurance purposes). Tell buyers “there will be more stuff” tomorrow if it’s your first day and tell them the prices will be lower the next day. They will return! Make sure your words are true. Do not 'hold' goods without a non-refundable deposit of $5-$10. Ask people what they are looking for if they don’t seem to see what they want. You may have it in the house and want to sell it! Tell them you’ll bring it out and ask them to wait. Always have a helper when you have a sale. More eyes prevent theft and customers you can’t get to while you are helping others, will wait if you acknowledge them and say you’ll be right with them. Don’t loose a big sale in favor of a small time consuming sale. Leave the $2 shopper to browse while you make the $20 sale. Don’t sit and look bored. If you look like you don't care if shoppers stop or not, they won’t. But don’t pester. There’s a lot to see, let shoppers look. If you’re getting a lot of drive-bys, you don’t have enough goods to stop for. Stay open while you pack-up. Last minute shoppers are the best: they are still shopping because they did not get enough stuff or they are garage sale addicts. They will buy right out of your packing box. They want a quantity discount. Don’t advertise an Estate Sale if its not! An Estate Sale is the entire household of goods left by someone’s passing, or seniors going to rest homes, or downsizing big time. Big time buyers will be especially angry with this mistake. 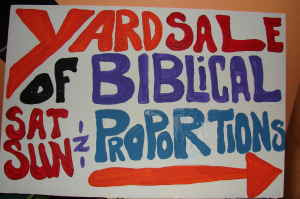 If you are selling from your yard and people cannot go in your home: you are having a 'yard sale' or 'garage sale'. Be open early, even if you have to get up and get everything ready in the dark… dealers and professional collectors will spend the most. Cater to them. They will arrive at 7-8 am. HAVE FUN! This is your chance to relive memories of the things you sell and share them with a perfect stranger who I promise you will buy your story with the item and appreciate both equally.